Most business people let their smart phones do the talking, texting, socializing & even networking for them – but none of them has mesmerized me as much as Motorola Flipout with Motoblur. What Issa? You dislike Iphones and Blackberries but you’re gushing over a phone worth less than $200? Remember I bought the cookie phone (KG500) from LG in May last year? I’m dissatisfied that it’s scratchy, touch-insensitive and auto-operating calls. Yet I never denied it had served a great music phone. It cost me $175. Can’t I afford a change? Motorola flipout is absolutely eye-catching. It’s incredible compact square form outshines the sparkle of other phones laid out for customers to play with. I spent about 20 minutes checking its specs. 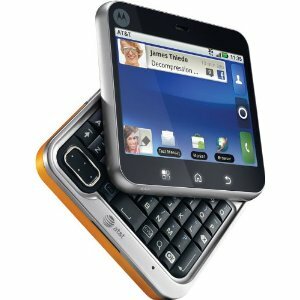 Its hip flip design, square shape, and convenient QWERTY pad swept me off my feet. I was dying to hold it again longer, longing to put my name on it next time.